Jaclyn Goldsborough joined the Regional Partnership in July 2015. Her key responsibility is internal and external communications on behalf of the Regional Partnership. From press releases to collateral material, Jaclyn’s work helps develop a clear, consistent, and concise voice for Northeast Indiana. With nearly 10 years as a journalist in Indiana, Jaclyn’s writing, communications, and multimedia experience has contributed to the team’s mission to build, market, and sell Northeast Indiana. 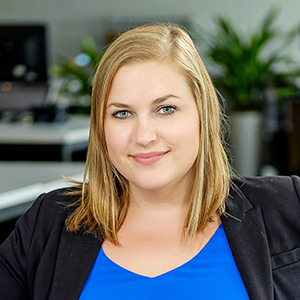 Jaclyn is passionate about the bright future of Northeast Indiana, and is guided by the need to create genuine, inventive, and creative storytelling to highlight the progressive business climate and quality-of-life assets in the region. In high school and college, Jaclyn worked at her parents’ family business, an auto-salvage and towing company, selling car parts. In addition to her work for the Regional Partnership, Jaclyn serves on the marketing committee for the Three Rivers Festival. In 2013, Jaclyn was awarded second place in environmental reporting by the Indiana chapter of the Society of Professional Journalists and honorable mention for column writing and coverage of minority issues. She grew up in Elkhart and received her bachelor’s degree from Ball State University, where she majored in journalism and minored in digital media and sociology. When Jaclyn is not feverishly working behind her computer, you’ll find her exploring the outdoors with her boyfriend, Mason, and their dog, Napoleon, or making a new playlist of her favorite music. In high school and throughout college, Jaclyn worked at her parents’ family business, an auto-salvage and towing company, selling car parts. Jaclyn loves to garden and has a self-proclaimed green thumb.